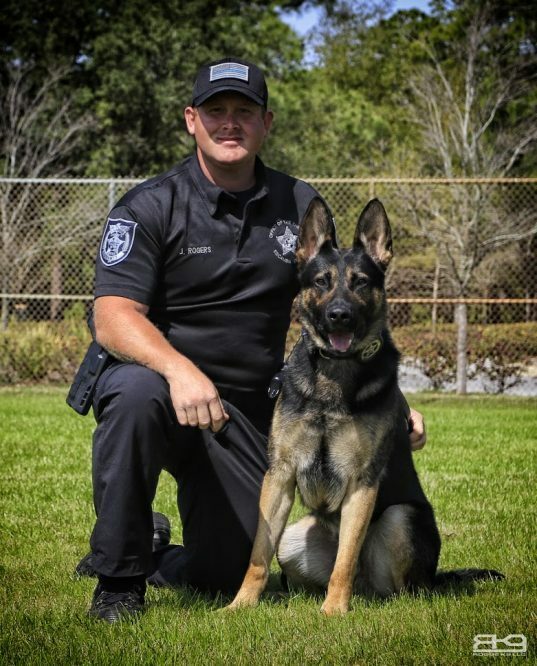 The Escambia County Sheriff’s Office K9 Unit consists of 12 handlers and dogs, which are trained to ensure the safety of the citizens and handlers of the county. Because of the dog’s superior sense of smell, hearing and physical capabilities, the trained law enforcement K9 is a valuable supplement to law enforcement. Each handler and their dog are subject to intense training prior to being assigned to Patrol. Upon entry into the unit, each handler must complete a 400 hour course with their K9. After the completion of the course, handlers must obtain state certification; as well as, well as certification through the United States Police Canine Association. This certification requires demonstrating a mastery of several different techniques such as narcotics searching and suspect apprehension; as well as, control and obedience. To request a handler and K9 for your school or event, click HERE.